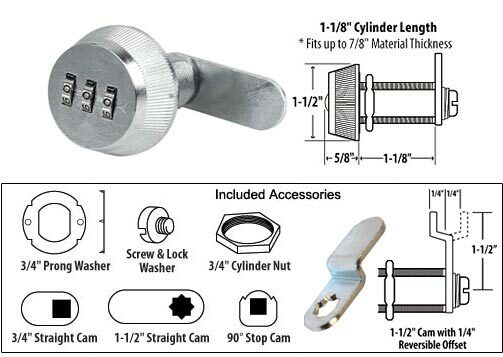 Combination Cabinet Locks: Secure, Durable & Easy to Use! The Combi-Cam is a secure, solid metal cam lock with up to 1,000 possible combinations and pick resistant dials. The combination is easy to change with no expensive rekeying kits required. To change the combination, simply have it on the opening combination, depress the change pin, and change to the new combination. It’s that simple! Great for use on cabinet doors and drawers, tool boxes, lockers and security boxes, chests, RV's compartment locks, equipment and more. Use in any location where keys are a hassle.